Unless you’ve been out of the country over the past few days, you know that most of the U.S. experienced pretty severe weather recently. 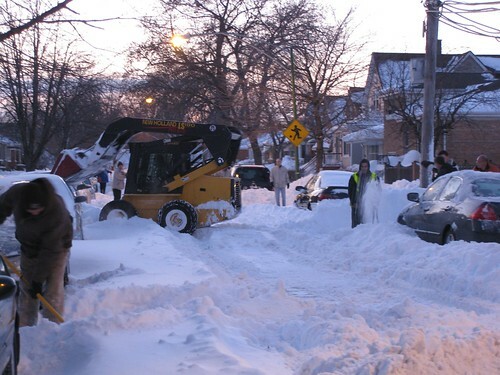 In Chicago we had the third worst blizzard ever (well, since weather records have been kept, at least). What I remember most about 1979 was that the snow was up to my waist (of course, the height of my waist was a bit lower then it is now) and that we had a day or two off from school. 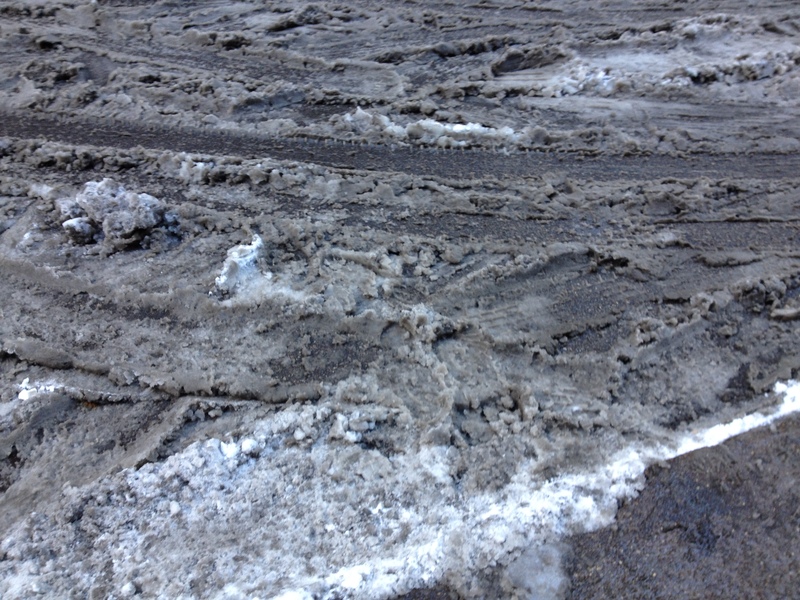 There was some shoveling involved, but I don’t recall it being onerous. My dad was doing most of it, I’m sure. 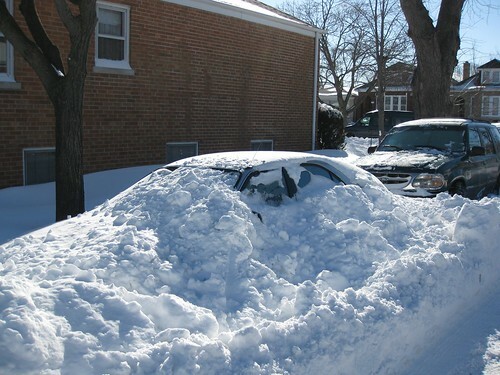 After that blizzard we bought a snowblower. In 1999, I was scheduled to move from my apartment of the previous six years to a condo purchased by my husband and I. We had canceled our telephone service (and also our Internet service, since back then we had dial-up like most people…and were probably pretty lucky for having it in the first place), and had all of our possessions in boxes. We also had no fresh food in the fridge and minimal food provisions, in general. I think it’s obvious that our move was delayed. Luckily, I had some good neighbors in the apartment building who fed us and let us hang out with them in their much more hospitable apartment until the movers could get down our street. For this blizzard, I was well prepared. I had plenty of provisions (even under normal circumstances, I have about a one month food supply on hand, it seems), two shovels, a new bag of ice melting compound, and a high speed Internet connection. My office closed early on Tuesday, but I had slipped out about an hour after the snow started and missed the big crush of commuters at the rail stations. I actually worked through the beginning of the storm. I had to finish up something and deliver it to my boss, so I worked until about 8:30 pm. Then I sat back with some wine and enjoyed the social media blitz, monitoring the #snomg trend on Twitter. I experienced thundersnow for the first time. It was pretty fun, actually. The next day when the snow stopped falling and the winds had died down (gusts were clocked at up to 70 mph in some areas) the clean up began. This is where neighbors helping each other becomes important. (Yes, its another instance where community has perks!) From my household, there were two folks with shovels: me and my roommate/tenant, Dave. We had to clear the following places of at least 20 inches of snow (more in some places because of drifting): front sidewalk, front steps, back steps, path to rear of yard (for trash removal), and driveway (so we could get the car out…not that it’s used every day, but it will be needed eventually). It took us about 1.5 hours to do this. I had to go back inside to attend a conference call meeting (the office was still closed, but I still had to work *sigh*). About two hours later we got back out again because we realized we’d need to clear out a portion of the alley in order to get to the street with the car. At this time there are many others out clearing the sidewalks and digging out their cars before the sun sets. Another hour of shoveling goes by. Then a guy with a small front-end loader just shows up. Really. No one knows exactly why he was out there, but people started approaching him and offering cash for him to clear some the snow. A portion of our street was cleared, the parking lot of the neighboring condo building gets cleared, and part of the alley gets cleared, too. By the time he was done (at least $250 richer) those of us living on the east half of the block were able to access the main arterial street (which the city was keeping clear of snow as a priority). I headed back into the house, shared with my roommate some of the beef stew I had started earlier, and had a bit more wine. Then I took a hot bath with lots of Epsom salts and went to bed. Things could have been much worse. 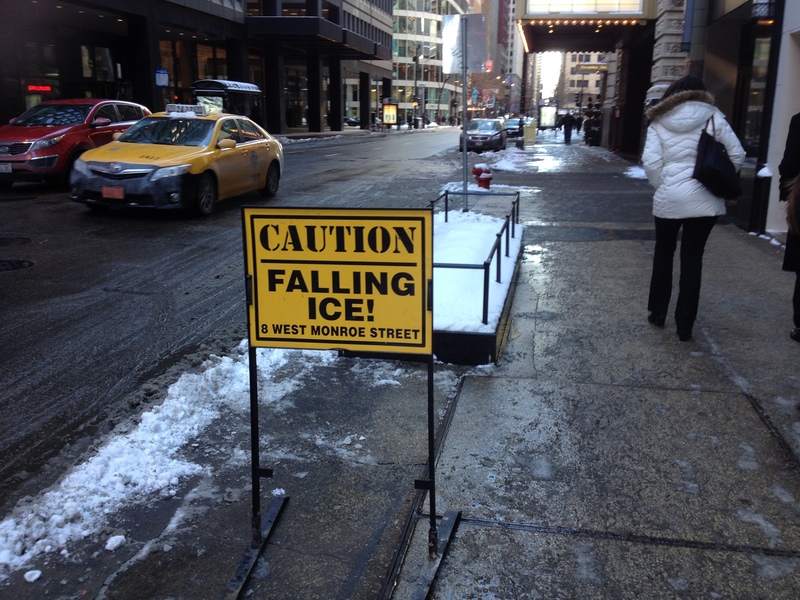 And the city really did a great job warning people and keeping the main streets clear, overall. We had power (and Internet!) throughout the entire storm and helped each other out. 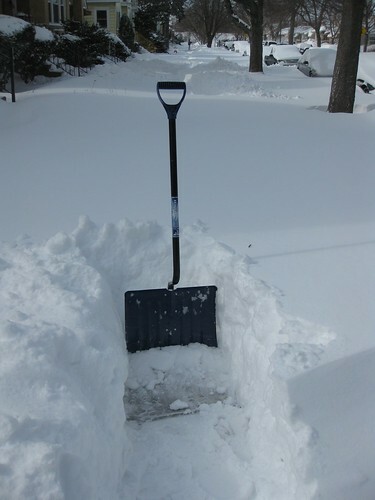 I got lots of exercise shoveling, and am only a bit sore. Not a bad experience, over all. Just when I think I can’t stand anymore winter, something like this happens to make it magical again. I love the snow. It quiets the city beast and forces everyone to slow down and respect nature for a bit. 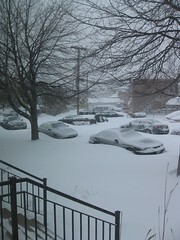 This snow started yesterday and has just steadily continued for the past 12 hours. I think it’s supposed to stop this afternoon. 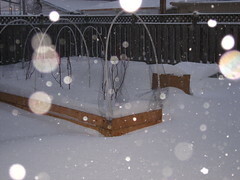 So far, we seem to have about 5 inches of snow here, but it’s hard to tell due to the blowing and drifting. Take another look at this scence (minus the pretty snowflake reflections from the flash). I think you can see my dilemma. The Eglu is nearly buried! 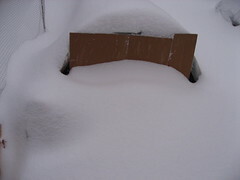 I had to carry a shovel out with me to dig out around the entrance in order to open it up. I learned from the last snowfall that I need to cover the entrance to keep snow from blowing inside the run, so I added some sheets of cardboard across the front. It may look as if the snow nearly comes to the top of the Eglu, but it’s not quite that bad. 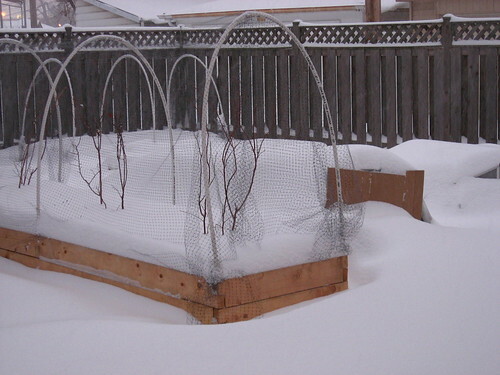 I had placed some bags partially filled with leaves in front of the cardboard to keep it in place, so the snow has built up on top of that. 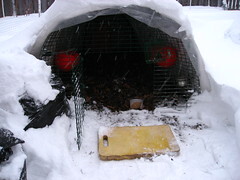 Once I got the Eglu entrance dug out, I was able to add fresh provisions of food and water for the ladies. Here’s a peek at the results. 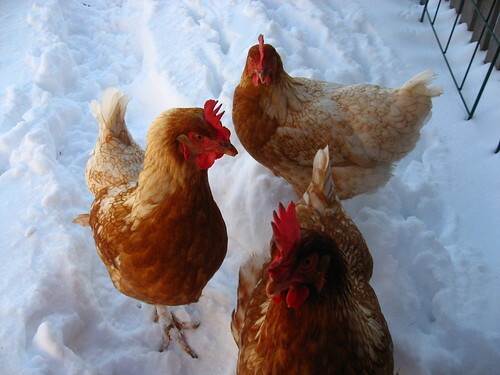 I highly doubt that the chickens will be roaming the yard today! The door to the run is open in case they choose to venture out, though. Inside the run it’s sort of dark with all the snow covering it, but at least it is dry and snug. I’m not really on a snow day. I still have to work, but thankfully I am employed by a fabulous, progressive organization and am able to telecommute today. So, I’ll have a chance to go out and check on the ladies during the day. Maybe I’ll slip them a bit of black oil sunflower seeds to brighten their day. While out digging out the chicken coop today, I heard one of my neighbors across the alley digging out around his garage. At one point, he seemed to be in a jam (based on the expletive he let fly), so I asked if he needed a hand. He couldn’t really see me through the fence that well; there was a bit of head bobbing and waving I had to do so he could see me and not think he was going a bit nuts. After he acknowledged seeing me and nicely declined my help, he paused for a moment. “Hey, are you the lady that was in the paper about a month ago?,” he asked. Yep.